-Towel rolled up with suit, goggles and swim cap inside. 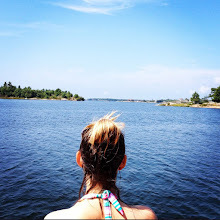 -Flip flops loose, a glimpse of summer at the bottom of the bag. 2. Carry enough change to pay for swim and two quarters; One for locker and one for if you mess up, and lock up too soon. 3. On the road to water, listen to music. Something that unfolds your heart. *This week I chose Neil Young’s Harvest Moon. 4. Change into swim gear… this can get precarious. *I have a thing about my bare feet touching the floor of change rooms and have developed a silly shoe balancing act that happens, during the switch between street shoes to flip flops and vise versa. It’s usually no big deal till snow boot season. 5. Braid hair, tuck into cap… transform into the swimmer. 8. And then tiny steps—almost a dance that only you can see—towards the pool and in you go. 10. 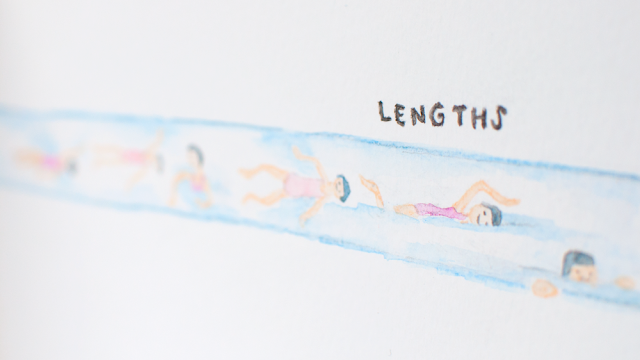 First length, always begins with a long long push off… so you can savor that initial glance of the pool underwater. The beautiful quiet hidden world of tiles and shadowy blues, and the sudden wish for gills and fins. Enjoy the rush of nostalgia that follows you, carrying with it all the underwater worlds you have known before. Of sunshine and floaties, of swimming lessons and splash fights, of water gymnastics and mermaid impressions… watch all of those things streaming beside you… and then a small dolphin kick and off into front crawl. 11. Swim until you cannot swim anymore. Rotate strokes. Use a flutter board and pull buoy. 12. Try to keep count. 13. End with one last length of crawl… a final flutter. 15. Release yourself from your swim cap and goggles. 16. Deal with the disaster that is your hair later. 17. Dry off and change into street clothes. 18. Roll the swimmer up into your towel. 19. Head home, this time with a song that can play along with the waves imprinted and ingrained into your skin. 20. And of course repeat. Always repeat. Oh and don’t forget to hang up your swim suit! 3. The Lindsay Aquatorium, now known as the Lindsay Recreation Complex. I love to create things. I have many dreams... and I like to make them real... with paper, scissors, glue, yarn and of course a whole load of imagination. I am a partner at the Monster Factory, where I make monsters.